What do you make of these three photographs? They were taken at Stow Maries Aerodrome yesterday. 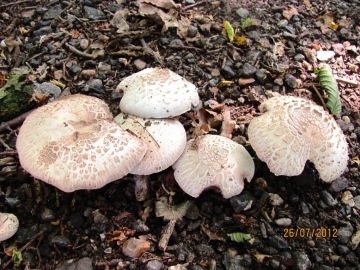 Have you ever seen Agaricus xanthodermus with this kind of scaly cap? Perhaps the result of heat stress? 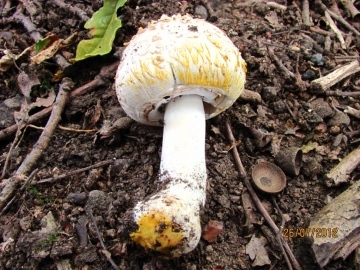 The cap edge and stem base turn bright yellow to the touch, suggesting xanthodermus, but the cut flesh turns reddish-brown in the cap, which is unlike that species. Yellow-staining Agaricus are a small group and you would think it might be easy - or perhaps I should know better by now! The only other possibility would appear to be the rare A. phaeolepidotus. Flora Neerlandica (5) states that this species does not discolor yellow on the cap edge, the yellowing in the stem base is often faint, and and that the flesh turns brownish in patches, occasionally pinkish, but not red. 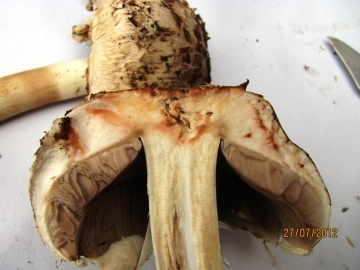 Funga Nordica, on the other hand, states that the flesh turns yellow on rubbing, especially on the cap margin and base of the stem, and that the flesh turns reddish after a while. Experts. Pah! I do not have Geoffrey Kibby's Book - do you? That might throw some definitive light on the matter. The three people I asked described the smell as ranging between carbolic and poo - fortunately I can smell neither! The photos on the websites I've consulted suggest this species is a possibility but then, on the other hand, one states that you will be confined to the toilet for 24 hours after eating them and another suggest that they are mild tastingand delicious! I think they are a bit confused too! I've dried the specimens and taken a detailed description but I'm sure they will turn out to be Yellow Stainers but you might be able to help me there.